Bounce-O-Rama! This Saturday, November 1! 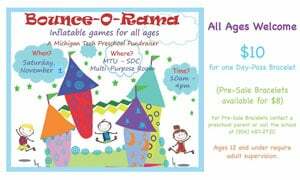 Bounce, jump, run & play at Bounce-O-Rama! This Michigan Tech Preschool fundraiser event will take place Saturday, November 1, from 10:00 a.m. – 4:00 p.m. in the SDC Multi-Purpose Room. Mind Trekkers, bounce house, toddler area, velcro wall and more! Pre-sale tickets are available for $8 from a preschool parent or call the school at 906-487-2720. $10 at the door. For more information, visit Bounce-O-Rama. You Can Dance Into a New Workout! Our fall Workshop Schedule is filled with individual classes that will help you break down the basics, get comfortable and challenge yourself to go deeper into your favorite programs! 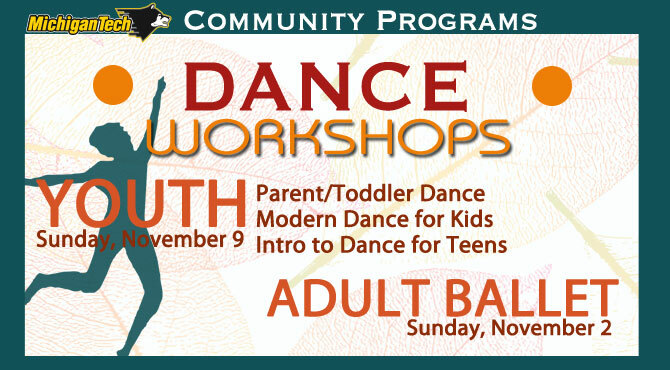 Try out one of the upcoming Dance Workshops! For a full listing of upcoming workshops, visit Workshops. 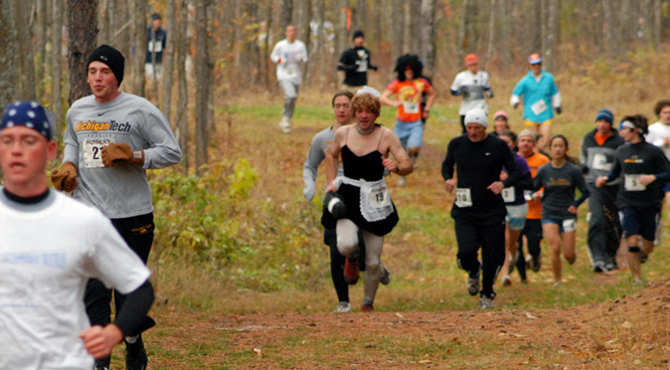 Michigan Tech is holding its annual Muck Run on Saturday, November 1 at 10 a.m. at the Tech Trails. The 5-kilometer trail race through mud, muck, mire, and maybe even snow, benefits both the men’s and women’s cross country teams. For more information or to register, visit Muck Run. Pilates + Yoga = Pi-Yo! Are you ready for this?? Imagine… the muscle-sculpting, core-firming benefits of Pilates combined with the strength and flexibility advantages of yoga!! 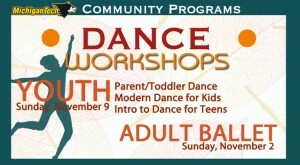 For more information or to register, visit Pi-Yo. Reminder… Dare to Enter the Haunted Ice Rink This Saturday! Witches, goblins and ghosts! Oh my! Dress up in your favorite costume and join us for the 3rd Annual Halloween Skating Party Saturday, October 25, 5:00-7:00 p.m. in the MacInnes Ice Arena. This event, hosted by the Michigan Tech Learn to Skate Program and the Michigan Tech Figure Skating Club, features family fun, games, treat street, a costume parade and contest. Admission is $7. Purchase tickets at the SDC Ticket Office. 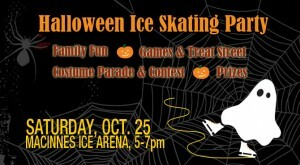 For more information, contact Michigan Tech Recreation at 487-2975 or visit http://www.michigantechrecreation.com/programs/youth/ice-skating/HalloweenSkateFlyer.pdf. Register Now for Fall Session 2 Adult Specialty Classes! Fall Session 2 Adult Specialty classes in Swimming, Aikido, Skating and Aqua-Fit will begin soon. Register now and take advantage of available savings options such as SDC member discounts and TechFit. HOUGHTON, Mich. – The Michigan Tech men’s basketball team held its Little Huskies basketball camp last week at the SDC. Members of the team taught drills and coached and officiated scrimmages from 4-6 p.m. on Oct. 6-9. Visit http://www.michigantechrecreation.com/camps/basketball/boys/little-huskies/20141013littlehuskies to see photos of the kids in action! Register now for Fall Session 2 Youth Classes! Fall Session 2 youth classes will begin soon for Swimming, Skating, Aikido and Hockey. Register now and take advantage of available savings options such as SDC member discounts, the Michigan Tech Employees Federal Credit Union member discount for swimming and skating, and TechFit. Halloween Flow & Glow Yoga Party October 28! ​It’s a little less zen and a little more upbeat, but you’re sure to have fun at this special vinyasa yoga class set to Michael Jackson’s Thriller! We’re bringing out the black lights, so wear some white or dress up in your favorite costume! Master self-defense tactics and safety techniques through a comprehensive course designed specifically for women ages twelve and up. It begins with a focus on awareness, prevention, and risk reduction/avoidance, and progresses to the basics of hands-on defense training. R.A.D. is offered by Michigan Tech’s Department of Public Safety and Police Services through Community Programs, and the course is taught by Public Safety officers. The class combines both classroom instruction and hands on physical training. Women only please. Minimum age of 12. Registration and payment may be completed online at www.michigantechrecreation.com/programs/adult/rad, by phone at 906-487-2073, or at the SDC Ticket Office. Youth Power Skating – Registration Now Open! Youth Rock Climbing Summer Sessions Begin June 11! Sign Up Today!